The John Bright Collection project started in September 2015, coinciding with Cosprop’s 50th anniversary celebrations. This project has been possible thanks to a generous grant that we received from the Heritage Lottery Fund and the committed support of our main partners the British Film Institute and film education charity INTO FILM, together with the Victoria and Albert Museum and Wimbledon College of Arts. In October 2014, General Manager Chris Garlick and researcher Isabella Carreras were looking into ways of digitising the John Bright collection so it could be accessible beyond Cosprop’s premises, knowing how useful it would be for other designers, students and enthusiasts all over the world. As is often the case, the cost of carrying out such ambitious project required additional funding to make it happen. So after a series of emails, calls and meetings, we were extremely pleased when the Heritage Lottery Fund showed an interest in our proposal, followed, almost a year later, by the good news about obtaining the grant. The rationale behind this project is twofold. The main and long-term outcome is this high quality website that showcases a selection of around 300 key items from The John Bright Collection. The creation of an online archive ensures that it continues to be a reference and learning tool to a much wider and varied audience. In-house curator Elizabeth Owen and John Bright himself have made sure that each piece is representative of the collection and has an interesting provenance and value within history of dress. Another important choice was to have the costumes mounted to museum standards. In order to achieve this, we developed a very precise system and appointed specialist costume mounter Gesa Werner, who brought her expertise to the table and thoroughly trained and supervised our group of volunteers. Mostly Costume Interpretation graduates from Wimbledon College of Arts, encouraged by their lecturer Elizabeth Dawson, the volunteers were an international, talented, fun and diverse team, and we even had designers Charlotte Holdich and Susannah Buxton helping out, packing, unpacking and steaming away on a regular basis. 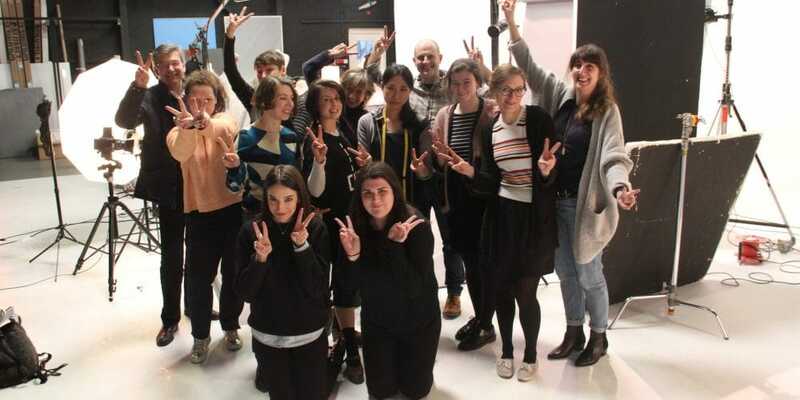 From October until March, Cosprop’s studio in Hampshire Street was heaving with action, and we made sure every milestone was celebrated with a smile and a silly picture for the record. Quoting the title of our project, we have tried not to reveal any of the images until the website has been launched, despite our weekly updates on Facebook, sneak peeks on Instagram and multiple hashtags on Twitter. Initially, some of the original garments in the collection were hired out and used for stage and screen, a practice that quickly provided John Bright with a reputation for authenticity, as can be seen in films like The Charge of the Light Brigade, and the early Merchant-Ivory works The Europeans and The Bostonians. Unfortunately it also showed how these pieces could not withstand the demands of a production, so it was decided then that the originals should become a reference collection and a template for the Cosprop stock, now consisting of over 50,000 costumes. This material heritage has taught John that the costumes we see on the screen should be clothes for real people, and by developing a truthful style, are thought to have started a trend in the 1980s that has been considered by many a new and unique national genre: British Heritage Cinema. Here is where our project’s second goal comes to play. Apart from creating this website, we have aimed to contribute to the understanding of costume making for Film and Television with a series of activities; to unveil the deeply unknown and often romanticised world of the costume house, and illustrate how designers, makers and other experts work as a team. It seemed to us that the most suitable partner would be the British Film Institute, and we were very excited to hear that their 2015 autumn ‘LOVE’ season, would be kick-started with the screening at the British Museum of the film A Room with a View, the epitome of British heritage cinema for which John Bright and Jenny Beavan received an Academy award in 1987. Over six months, an exhibition at the BFI Southbank was organised with curators Claire Smith and Nathalie Morris that showcased the costume designer’s journey from script to screen, and included three outfits from A Room with a View; John Bright was invited to discuss his career as part of the BAFTA Masterclass scheme; and a study day titled ‘In Love with Costume’ joined together film-costume scholars and practitioners, rounding up a very enjoyable and successful collaboration. INTO FILM, an associate partner of the BFI responsible for delivering a UK-wide film education programme for 5-19 year olds, offered our members of staff the opportunity to come to the front line, getting some well-deserved credit through a number of screenings and presentations where they spoke to children and young adults about the industry and potential career paths. And with the Victoria and Albert’s Museum study day, held in September 2016, we came full circle, summarising the spirit of this unique project that has brought together different generations with equal interests, connected a carefully assembled collection with the ‘Cosprop style’ and British Cinema and Television, and most importantly, celebrated 50 years of dedicated work.